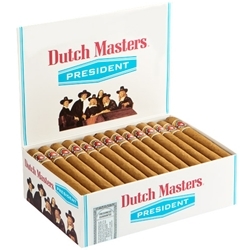 Dutch Masters President Deluxe, is a classic mild and mellow flavored cigar, created with a special blend of natural Cuban-Seed tobaccos, wrapped in a rich tasting Cameroon tobacco leaf. A high quality machine made cigar shaped in the corona style, boxed up and ready to offer you a pleasant and relaxing smoking experience. Dutch Masters President Deluxe cigars are mild and mellow and loaded with classic, rich pipe tobacco flavors. The aroma is to die for. One of the most popular and best-selling machine-made cigars in America since 1912. Available here at Smokers Discounts!